In changing market dynamics, Healthcare sector is facing many external changes than any other industry sector. These changes are in the form of consumerisation of healthcare, increasing awareness, policy changes in pricing of medical devices and drugs, push for generic drugs, ban on combination drugs, medical device rules, etc. Advancement in technology like artificial intelligence and machine learning are expected to eliminate the need for human intervention for routine jobs in healthcare. The existing manpower will need to acquire new skills and new managers while leaders need to be prepared to function in the VUCA (Volatile, Uncertain, Complex and Ambiguous) world. To deliberate on how the healthcare organisations are evolving in such an emerging environment and the nature of skills and competencies needed in future of jobs, a roundtable meeting was organised by PGDM Healthcare program under theme “Evolving Healthcare Organisation in an Emerging Environment”. 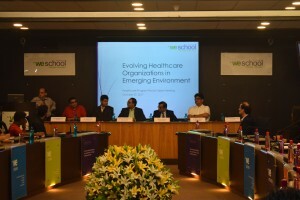 The meeting was attended by eminent panelists like Mr Saumil Mody, Commercial Operations, Eisai Pharmaceuticals; Mr Vishal Gondal, CEO, GOQii; Mr Vivek Tiwari, CEO, Medikabazaar; Dr Milind Antani, Partner and Head – Healthcare, Nishith Desai Associates and WeSchool Alumnus Mr Koustubh Kanade, Country Head South-Asia, Panasonic Healthcare. The discussion was moderated by Mr Vivek Padgaonkar, Former Director, Project and Policy, OPPI (Organization of Pharmaceutical Producers of India). The event started with an introduction to PGDM Healthcare program by Dr Bhagwati Prasad, Associate Dean – Healthcare Management, WeSchool, Mumbai and how Healthcare education at WeSchool is evolving with changing business environment. A Startup Accelerator Program has started at WeSchool in September 2017 to encourage students to opt for entrepreneurship. Opportunities are being provided to students to transform as creators/contributors of educational content from being consumers of educational content. 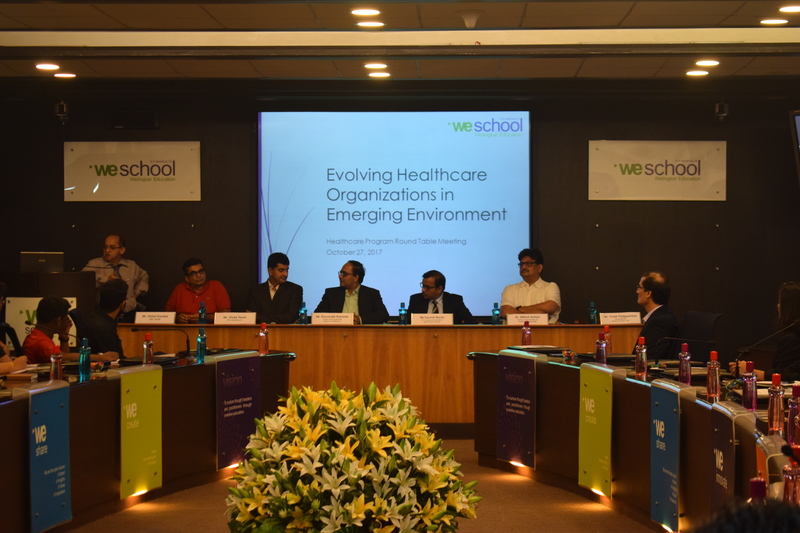 The curriculum at WeSchool is regularly updated in anticipation of the changes in the healthcare ecosystem. Two PGDM Healthcare 2016-18 batch students, Ms Priyanka Modi and Ms Kritika Mengi presented their internship project work carried out at TCS DISq. Stating about Healthcare sector’s issue, Mr Vishal Gondal, CEO GOQii, mentioned that the cure based business model has a conflict of interest. We need to move to a care based business model where the consumer is motivated to remain healthy. He said that we need to use gaming approach to motivate people to be healthy and transform “payer to a player”. For example, insurance premiums could be reduced if you are healthier. He advised students to create solutions and start their own ventures. Speaking of the new developments in Healthcare, Mr Vivek Tiwari, CEO, Medikabazaar, said that the biggest risk in life is not taking any risks. He mentioned that the biggest problem is access to quality care. One and half decades ago it was all about products and services. Now the sector is largely driven by the people-centric approach and there is a shift towards home healthcare. He advised students to not be averse to taking risks. Highlighting the innovative side in Healthcare, Mr Koustubh Kanade, Country Head- South Asia, Panasonic Healthcare, said that there are three disruptive forces at work. The first is that the patient is more knowledgeable and wants to be in charge of his/her treatment. Second disruptive force is technology. The reach of mobile phones and internet are some examples that showcase the power of technology. The third disruptive force is innovation. Major alteration will be brought about by businesses currently outside the healthcare sector. He advised students to form a network of friends and peers and to be adaptable and flexible. Giving his word of advice, Mr Saumil Mody, VP-Commercial Operations, Eisai Pharmaceuticals, advised students to learn from others and not to shy away from Pharma sales job. Focussing on the pricing vs affordability topic, Mr Mody spoke on how Pharmaceuticals is a unique industry where customer and consumer are not the same. He said that most of the population in India is uninsured, and hence there is a pressure to reduce prices of drugs for increased affordability. He opined that only reducing the price of medicine will not be sufficient and quality and access need to be addressed too. Dr Milind Antani, Partner and Head – Healthcare, Nishith Desai Associates inspired students to be passionate about their work. He said that healthcare is better delivered from the heart. In the current environment, being dually qualified is a need as there is an increasing requirement of one person doing many things in the organisation. He advised students to pursue what they love and money will come anyway as a by-product. Mr Vivek Padgaonkar, Former Director (Projects and Policy), OPPI, spoke on the transformation of Pharma sector saying that the industry has evolved three times. Pharma 1 was blockbuster centric. Pharma 2 was doctor-centric. We are in Pharma 3 model, which is patient-centric. A collective concluding thought from all panelists expressed long-term growth and sustainability in the healthcare sector. Newest trends are bringing health solutions to the customer and at home. GCL (Global Citizen Leadership) projects posters and prototypes were exhibited outside the meeting room. The high-energy event concluded with high tea and networking session.